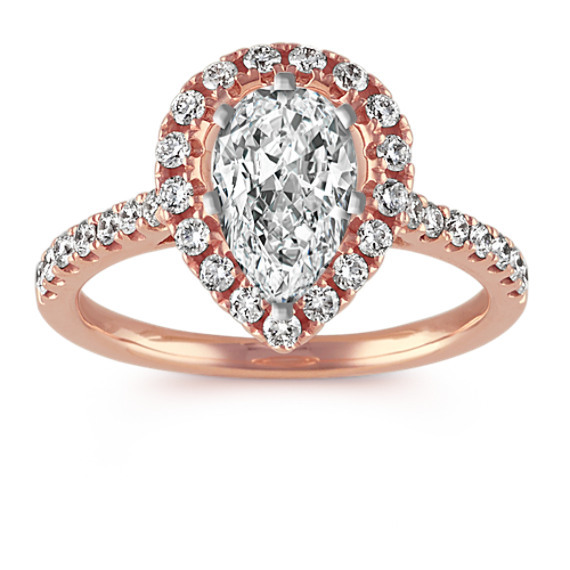 Pear-Shaped Halo Diamond Engagement Ring in 14k Rose Gold | Shane Co. This twinkling engagement ring allows your chosen 1.00 carat pear shaped gemstone to be set within the halo. This design is highlighted by 31 round diamonds, at approximately .42 carat total weight, pavé-set in quality 14 karat rose gold. The ring is approximately 2mm wide at the band and 13mm at the center. Gemstone Carat Weight :.42 ct. t.w.